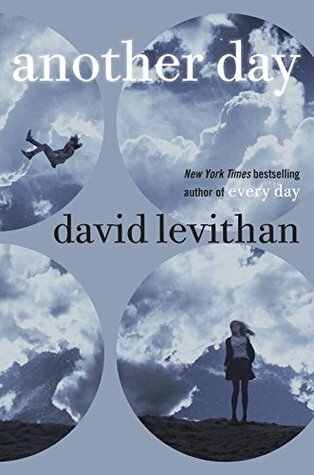 David Levithan wrote Another Day as a “twin” novel to Every Day. It is supposed to be able to be read as a stand alone novel or as a companion novel to Every Day. I recently read Every Day and I absolutely adored it. It was such an amazing book. So I can only do a review based on the fact that I read this as a companion to Every Day. My thoughts on this book may have been much different if I had read it as a stand alone. I loved Every Day and was very excited to read Another Day. I was really hoping that it might be a continuation of A’s story. I was a little disappointed when I found out that it was actually the same story but from Rhiannon’s POV. I still expected great things though. I hate to say this, but I was so disappointed. This was literally the less interesting version of Every Day. At least half of the book was word for word the exact same as Every Day. I understand that this is obviously going to happen with it being a “twin” novel but it made it hard to read. The parts of the book that were different were not great. It was impossible to connect to Rhiannon in the same way that I connected to A. Like I said earlier, I may have felt differently about this book if I had not already read Every Day, but I did. I read it and it was awesome and this one just wasn’t. I recently went to a work conference in Baltimore and when I got back I had been tagged in a couple of book tags! I don’t want to overload you with book tag posts so I am going to squish them together into one post. So be prepared, it is going to be a long one. Tagged by The Night Girl. I work at an office from 8-4:30 so, unless it is the weekend, my only opportunity to read is in the evenings. A: Are there any books that have changed the way you think about things? Reading has completely shaped the way that I think about everything. Books have helped shape who I am as a person. I couldn’t tell you one book that completely changed my view of something but I take a little something from everything that I read. Y: Young Adult or not? I love YA books. I can’t imagine there will ever be a time when I won’t read YA. A: Are there any characters that you honestly believe to be real? I believe that all characters are real. Authors always take little pieces of the people they love and put them into their characters. So, while the character as a whole may not be real, there are parts of them floating around in the real world. Several people use my Kindle login to read my e-books but I am a little more picky when it comes to my physical copies. It is hard for me to part with them. The majority of my books are on my Kindle, so not usually. I do love the smell of a bookstore though. N: Not everybody likes books, is this a positive or a negative? I can’t think of one single reason why this would be a positive. There is so much to gain from reading. I: I keep my books in the best condition or maybe I don’t? Which are you? I take very good care of my physical copies of books. I don’t like to crack the spine or bend the page corners. G: Gosh, I have too many books! True or False? False! I definitely buy books much faster than I can read them, but there is no such thing as too many books. H: Have you ever stained your books with something? If so, how? Yes, a few times. Once I had a soda leak on my nightstand and my poor book soaked it all up. T: Toned or un-toned while reading? Do you work out while you read? Would you rather only read read trilogies or stand alones? I can appreciate a good stand alone novel, but I prefer series. When an author creates an amazing world with characters that I love I never want it to end. I prefer to shop at bookstores. I love the feel and smell of a physical book. That being said, I buy the majority of my books on my Kindle. I buy so many books that I just can’t afford to get physical copies all of the time. It really depends on the book. Stand alone novels are better as movies. Series with 2-3 books are also best as movies. Series with more than 3 books are much better as TV shows. 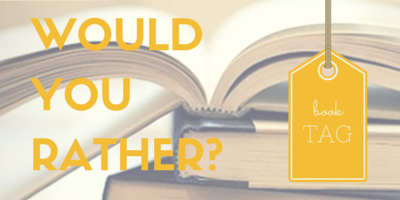 Would you rather read only 5 pages per day or 5 books per book? Definitely 5 books per week. I generally read at least 4 books per week. I would rather be a librarian. I think it is very important that everyone have access to books, especially those who may not be able to afford them. Definitely my favorite genre. I enjoy reading books from every genre but YA is my favorite. YA is such a broad genre that I could read just YA for the rest of my life and never get bored. I would probably choose to read only e-books. I love physical books but I can buy 5-10 e-books for the cost of 1 physical book. If you were interested in doing one the book tags but you weren’t tagged in it please feel free to do it anyway! If you do one of the book tags make sure to tag me in your post, I would love to read your answers! After twelve hours of traveling yesterday, I am finally home! I had an amazing time on my trip but it was so nice to wake up in my own bed this morning. I can not for the life of me remember where the cord to my camera is, so I am only uploading a few pictures that I got on my phone. This first picture is of my beautiful cousin and I sitting on the wharf. She happens to be five and a half months pregnant, so there was a lot of sitting on this trip! I had a blast exploring Baltimore and Washington, D.C. but I missed you guys! I wanted to have a post scheduled for every day that I was gone, but time got away from me and it just wasn’t possible. I managed to get up a review for Every Day by David Levithan and a post for The Book of Speculation’s book birthday. 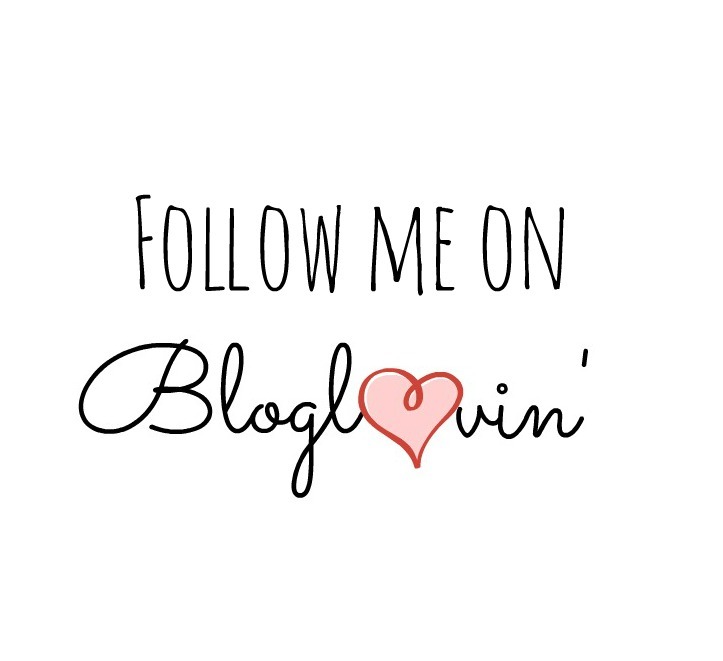 (If you want to read it you still have time to enter the giveaway!) I managed to get a little bit of reading done on my flights. I finished Another Day and I will try to get the review put up today. Just a little more about the trip…We stayed at The Admiral Fell Inn. It was a fun little hotel right near the water. It was surrounded by shops and bars. There was so much stuff to do and not enough time. 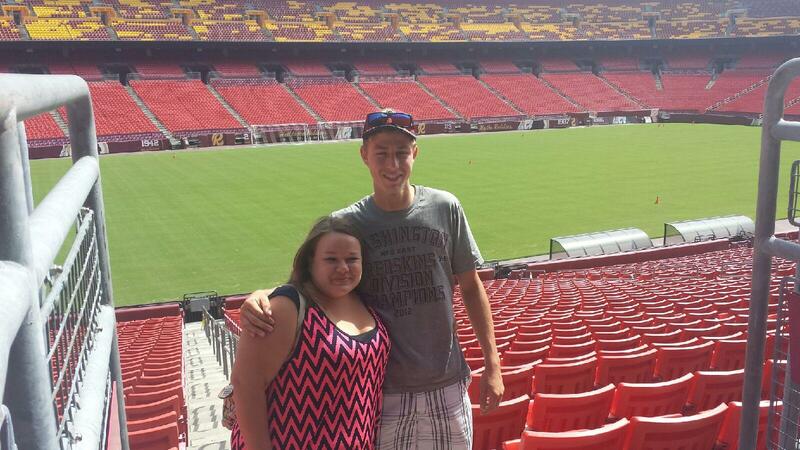 On Tuesday, after we left our last class of the work conference, we were able to visit the Washington Redskins stadium. I am a HUGE Redskins fan so this was super exciting. Apparently you have to schedule a tour online to be able to see the inside of the stadium, which we did not do. We managed to convince the security guard to let us see it for just a minute! My cousin is also a huge fan and he just graduated from high school so it was really amazing of the security guard to let him see the field. 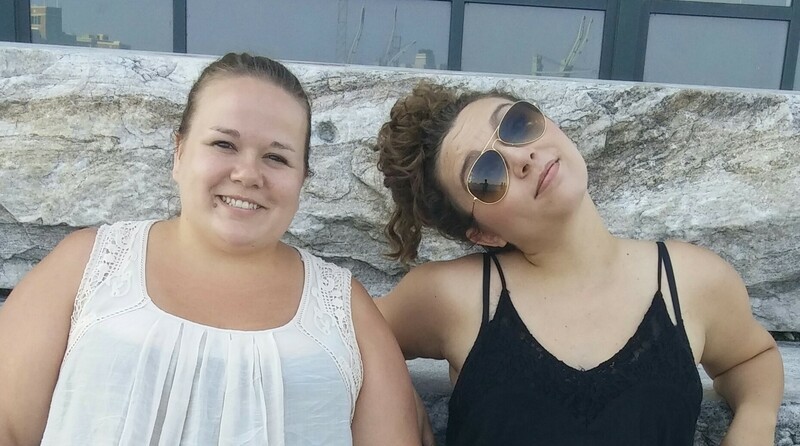 This picture is of my cousin and me. You can definitely tell how happy we were. After we left the stadium we made our way to Washington D.C. Most of my co-workers had never been, so everyone was really excited. We managed to see the Washington Memorial, the Lincoln Memorial, the World War II Memorial and the White House. It was really awesome to be able to see everything but it was HOT. It was a lot of walking and a million degrees. It was exhausting! Luckily, I have the next few days off. While I was away the blog still had a lot of activity. 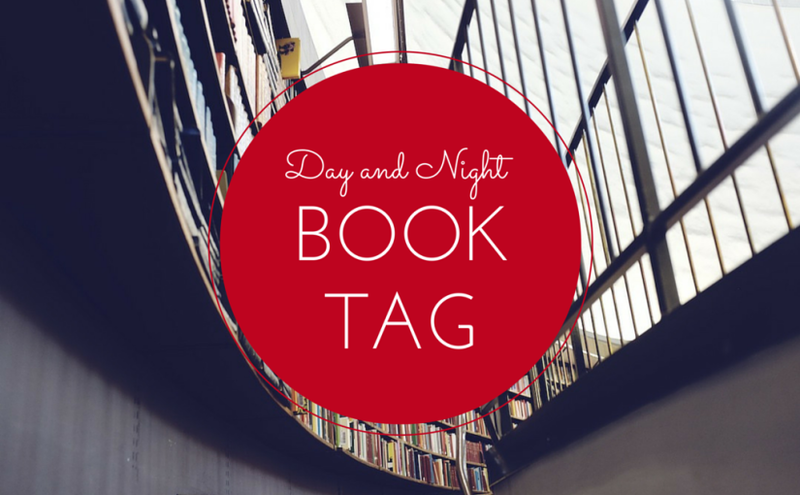 I have never been tagged in a book tag and while I was gone I was tagged in three! I was also nominated for the Beautiful Blogger Award and the Sisterhood of the World Bloggers Award. I don’t want to overload you with a ton of posts right away, so give me a week or so to get a post up for all of them. I also have a few book reviews coming, as well as another book haul, a June wrap-up and mid-year update. A lot of fun posts coming your way, so keep your eyes open! Thank you for the never ending support and encouragement! 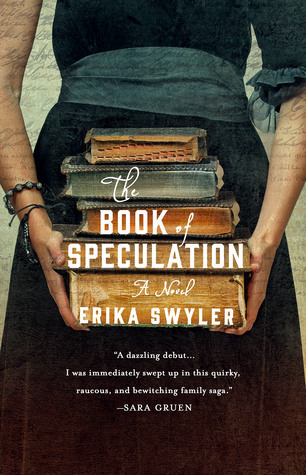 The Book of Speculation comes out today!! This is Erika Swyler’s debut novel. It is beautiful and haunting and perfect. This is my favorite book of 2015 so far. I loved it! You can read my review here. I loved this book so much I am giving away one hardback copy! The giveaway ends 7/2 so don’t forget to enter!